This is a collective blog about traditions in Europe. We are teachers and students working on an eTwinning project and trying to promote communication, diversity, culture and preservation of traditions and customs. The materials that you, the visitor, will see here are original, created by our students. It is our way of celebrating the heritage we were born with. Thanks if you can sort this for me ? I think a narrow sonific would be more suitable for the blog! Problem solved…I think. Is the new sonific box ok now? Choosing traditional songs of each country was very kind of you! I confess you I didn’t know the Italian one: who knows what part of Italy is it from? Thanks Liliana and good work! Unfortunately, I have no idea what part of Italy the two songs here are from, but I’ll try to find out. I couldn’t find traditional music from all the countries in the project. That’s why I invite all the partners who haven’t found songs from their countries to post one or two here. Hi I look forward in joining this community and post some informations on Icelandic traditions. Welcome! We look forward to finding out more about the Icelandic traditions, too. It’s nice to receive positive feedback from people. Thank you for encouraging us. I hope you’ll read us regularly, you won’t be disappointed. I’d like to highlight a lovely ppt presentation about Maltese traditional Easter celebration I found on our etwinning twinspace. It’s very interesting and worths to be noticed. CONGRATULATIONS to our Maltese partners! I uploaded that ppt file last evening. I found it on our TwinSpace and I asked our Maltese partner, Noel, to post it on the blog, too. I would have posted it, but it would appear under my name, so I am waiting for Noel to do it. I only helped him upload it. Noel, we’re waiting for you to post your ppt file about Easter! The Blog is without music: if it can be useful, I found a new songspot for my blog “in http://www.playlist.com“. Sonific went off on the 1st of May and that is why we don’t have music on the blog. I created a list on http://www.playlist.com, but I can’t embed it on our blog so that it would start automatically when the blog is accessed. 😦 Can anyone help me with this? I created a playlist on http://www.playlist.com/ and I embed it on my blog. You have to click on create a code, follow the instructions and copy the code , then you have to paste it directly on the html template where you prefer , save and it will appear on the blog! I did the very same thing, but, although the icon appears on the blog, the music doesn’t start automatically when you access our blog. That is the problem. Can you try to create a playlist and then embed it here? Maybe it will work for you. Yes, of course! I’ll try soon! I create a playlist and got a code but where I can find the html page to paste it? Since Yesterday night I have been going around the blog everywhere but I couldn’t find anything of similar to what I have in my Blogger Blog!!! I really hope it’ll work. “do you think you will keep up cooperation next year? it seams a good group, you should keep working together! alexandra nss ita “. What do yo think about it? Bellissimo! I am thinking of going on with this project as long as possible, because more and more people visit us and want to join our project. What do the other partners think? I’ve tried again to place a playlist widget on the blog but it’s too large and it doesn’t work! I’m sorry! yes it’s a busy time in schools here…it seems to get more hectic as the holidays approach each year.. Next week a person from our National eTwinning agency is visiting our school to thank our pupils for their efforts throughout the year . I’ve just seen lovely stuff on our twinspace! I visited your school blog: very nice! Compliments! You’re one of the few Primary schools in this project, aren’t you? When will you finish the school? We have just finished on June the 6th. Next year I will let my children visit your blog, It could be useful to improve their little English and to know with children of an other country do at school. If you please to visit it, we have our own blog, go on http://italiachiamaeuropa.blogspot.com . 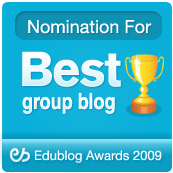 As I wrote to you yesterday, I would like to apply for the European eTwinning Prizes 2009 and most of you encouraged me to do that. Here’s a wonderful e-mail from Gina, who also brings great news for us. 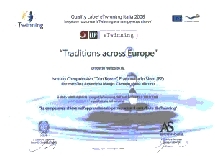 you are talking about the “European eTwinning Prizes 2009″,aren’t you? Of course you must apply! The projects deserve it and all of us, too! By the way, I’m glad to announce you that, on 10 and 11 November, Mario and I will be at the Italian eTwinning seminary in Pistoia where the project” Traditions across Europe” will be praised as an example of eTwinnig project in Italy and a description of it ( written by Mario and me) will be inserted in the “eTwinning publication 2008″. It’s the first review for a great project and I’m sure many others will arrive. So apply right away! I think we should all be proud of our work. I entered the “Carolling…” blog into the competition a few minutes ago (you will also receive an e-mail from the eTwinning team about that) and I will enter the “Traditions…” blog as well these days. If you have suggestions, ideas, anything that would help me present the project better, please feel free to write to me. I keep having a look at your wonderful and inspiring work. I have no time to contribute to your blog but I may one day when I get more time. Continuez ce beau travail de longue haleine.Quel bonheur de vous lire et de vous entendre tous! You are always welcomed to contribute. Thank you for your support! I have found out about this wonderful site and I would like to join with some Serbian traditions. I am an English teacher at primary school. I would like to encourage my students to use English, to learn more about other cultures and traditions. How do I get started? Thank you for your message and welcome to our blog. I will send you an invitation to join us here and I will e-mail you with details soon. as you know, in 2007 we started the blog called carollingineurope.wordpress.com and every year, around Christmas, we posted all types of materials about it. Would you like to do that this year as well? It would be nice to gather all of us again on the occasion of such a dear celebration to us, the birth of Jesus. Let me know if you want to join.